To snap or not to snap? That is always the question. Waking up with bed head — not to snap (okay well maybe just to friends #wokeuplikethis). Morning KAF line — definite snap. Thursday night rager at Bar Hop — add a filter and snap that to your story ASAP! Snap what you want when you want and it will disappear in just 24 hours. Although snaps disappear after a few seconds, can they have long term effects on your mental health? Snapchat, a photo and video messaging application that was founded by two students from Stanford University and was initially released in September 2011, has gained massive popularity in the past four years. Current Snapchat CEO Evan Spiegel said that over 100 million people use the app daily. In October 2015, a 15-year-old girl wrote a viral article about how Snapchat made her feel awful about herself. She described how she would ceaselessly check Snapchat to find out what her friends were doing, and then feel excluded or depressed. She argued that Snapchat amplifies the fear of missing out, often abbreviated to FOMO. Interestingly, that same month, a study from the University of Michigan came out claiming that Snapchat actually lead to greater satisfaction than other forms of social media. So who do we believe — the opinion of a 15-year-old girl or the results of a scientific study? Does Snapchat create social anxiety or does it enhance one’s mood? 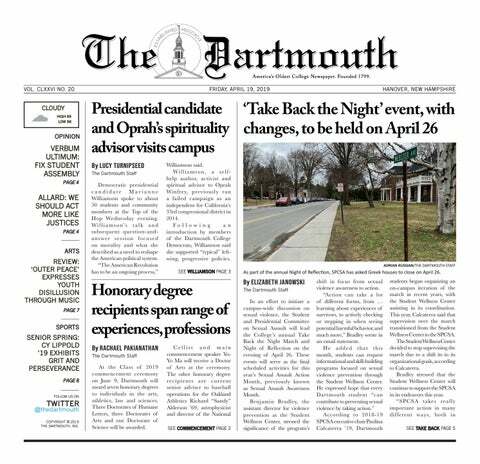 We talked to some Dartmouth students in the library to find out their take on the social media’s effects on the psyche. Dartmouth students use Snapchat to document their everyday lives and to stay in touch with friends who are experiencing life outside the Dartmouth bubble whether they are globe-trekking, crunching data at their finance jobs or relaxing at home. Penelope Williams ’16 described her go-to snap. “I mean honestly the times I snap most are when I’m home with my bird,” she said. Daniel Reitsch ’16 explained that he likes to use Snapchat with friends who are especially entertaining and weird because the photo and video features leave room for creativity. Aleena Vigoda ’19 agreed that following funny people on Snapchat was a good use of the service. While other Dartmouth students may not be as creative with their snaps, they still use the app to communicate with friends about the monotony of their everyday lives. Sitting in Novack Café working on classwork, Clara Guo ’17 explained that she uses Snapchat when she is bored. “I really only snap like three or four people consistently so they get to see this part of my day,” she said as she gestured to her pile of work and KAF coffee. Vigoda said that using Snapchat is an easy and enjoyable way to procrastinate. “It’s a nice way to kill time,” she said. Because students use Snapchat when they are bored, students felt that it was a more accurate representation of their day-to-day routine than other forms of social media. Hannah Gallen ’19 said that she likes that she can see what is happening during someone’s whole day through Snapchat. “I think Snapchat is a more accurate representation of everyday life because people are posting little clips of things that happen throughout the day — it can happen at any time,” Gallen said. That being said, there is a huge difference between sending a Snapchat of you studying to your friends and posting it to your story. If you post it to your story, there is the potential that the attractive classmate from your first-year seminar or that mostly forgotten person from your hometown might see your snap. Gallen said that people whom she does not know well sometimes view her Snapchat stories. “I have a lot of random people that view my stories that I met like once or twice and somehow exchanged Snapchats with,” Gallen said. For that reason, many students had strong opinions about posting to their stories. Reitsch was adamant about the fact that he never viewed people’s stories. Since everyone can see your story, Guo said that she felt stories were often of people doing fun things and partying rather than studying. She speculated that students with these posts felt really comfortable sharing that part of their life, whereas she chooses not to post to her story. “Sometimes at parties I’ll post to Snapchat because everybody else is posting to Snapchat and I have to make it clear that I was there too,” she said. So would seeing other people partying and having fun make some students feel like they are missing out? Reitsch expressed the opposite sentiment. He felt that Snapchat allowed him to live vicariously through events happening around the world. Others feel that Snapchat can create or exacerbate FOMO. Zach Schnell ’18, who chooses not to use Snapchat, said that the act of not having a Snapchat or not viewing snaps could potentially create a sense of FOMO. Williams purposefully doesn’t look at people’s stories, saying fear of FOMO contributes to that decision. Vigoda siad that she did not really feel any sense of FOMO from Snapchat, noting that if she saw something fun she could easily go to that event because Snapchat is happening in real time. She said that she felt that Snapchat is often a less distorted form of social media because people posted bad photos of themselves and Snapchat filters are less built-out than those on Instagram and Facebook. Williams said that other social media sites like Facebook construct less realistic images of people’s lives. Gallen also noted the differences between Snapchat and Facebook. She said that posting a story to Snapchat feels temporary. “It’s less of a big deal than posting something on Instagram — it’s gone in 24 hours and there’s no permanent record of everything you’ve ever posted,” he said. Williams agreed that the short-term availability and casualness of Snapchat creates a less intense atmosphere than other forms of social media. She said that because people are constantly snapping, and since it is nearly impossible to keep up appearances all of the time, there is less pressure associated with using Snapchat. As to whether or not Snapchatting detracts from the enjoyment of a situation or event, Williams said that the brief amount of time required to take and send a snap shouldn’t detract from the enjoyment of one’s experiences. “I think as long as you are not Snapchatting the whole event, it’s such a short thing it should be fine,” Williams said.